These rice based, sweet fenugreek dosas are called surnali/godu polo in Konkani. Godu means sweet and polo means dosa in Konkani. A popular Konkani breakfast. People who don't love sweet breakfasts make the dosas a little less sweet, skip the sugar on top of the dosas & enjoy these dosas with a spicy coconut chutney. 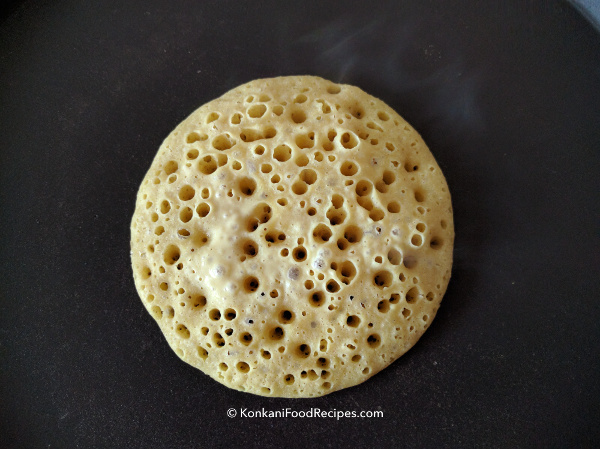 Make tiny dosas for your kids and I'm sure they'll love them with butter or ghee. Or you can also cook them in an appe/paniyaram pan to make them into delicious puff pancake/sweet appe. You can reduce the amount of jaggery you add to the dosa or also make these dosas without jaggery if you do not like sweet dosas. They are then called as chappe surnali in Konkani. These dosa taste best when their batter is well fermented, so grind the batter 8-9 hours before making the dosas. If the weather's cold ferment them for longer, 10-15 hours. If you live in cold regions look for tips to ferment below. There are many ways you can surnali. Here's how I make them at home. My MIL's recipe, that has never failed so far. P.S: Provided you follow the proportions right to get perfect surnali - delicious, soft, fluffy. 15 minutes of prep the previous day & you can have a carefree breakfast the next morning. 1. Soak rice for at least half an hour. Then wash the rice well and drain out all the water. 2. Grind rice (& fenugreek seeds in case you're using them) into a smooth paste using as little water as possible as the batter should be thick. 3. When the rice grains are almost ground, add in fenugreek powder (if you haven't used fenugreek seeds), cooked rice, beaten rice, jaggery, salt, turmeric powder and continue grinding until you get a smooth paste. Add jaggery according to how sweet how would like your dosas to be. 4. Transfer the ground batter into a vessel. Check & adjust salt, the sweetness of the batter. Allow the batter to rest for a minimum of 6 - 8 hours. 5. The batter tends to rise overnight so use a bigger vessel to hold the batter. During the resting time, fermentation takes place. The right amount of fermentation is important to make delicious, soft, fluffy dosas. If it ferments less then it won't give you soft, fluffy dosas. If it ferments for too long then you'll have a bitter batter & the dosas will taste bitter. The weather's cold? Read more about fermentation time & fermentation tips below. Salt, when is added, fastens fermentation during the resting period. 6. The batter gets fluffy and airy after overnight fermentation. You are now ready to make soft, fluffy dosas. 7. If the batter is too thick and doesn’t fall off the ladle, then add about 1/4 to 1/2 cup of water to the batter and mix well. 8. To make dosas heat up a frying pan, grease the cast iron pan with enough oil so that dosas don’t stick to it. If you're using a non-stick pan then skip the greasing step. 9. 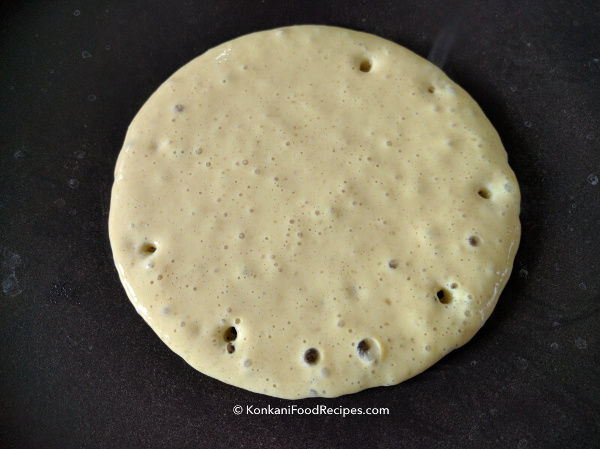 Onto the hot pan, add a ladle full of batter and spread it a little into a circle using the back of the ladle. As it cooks it puffs up. 10. Keep the thickness of the dosa according to how you like your dosas to be. If you want soft, fluffy dosas then keep the dosas a little thick. The more you spread using your laddle, thinner your dosas will be. 11. Cook the dosas closed on medium heat. Once the bottom of the dosa is completely cooked, the top part of the dosa changes its colour completely. That's when it's time to flip the dosas. 11. Drizzle oil on top of the dosa and flip it. 12. Cook the other side on medium heat until it starts to turn golden brown. Some guys don't flip these dosas, they cook them on only one side until the dosa is completely cooked. But I like them cooked on both sides. 13. Serve hot dosas with ghee on top and with a spicy coconut chutney. Or serve dosas hot with ghee and sugar on top. You can even serve these dosas with butter instead of ghee. 1. Store any remaining batter in the fridge, empty it the next day. Dosas don't taste good after that. They tend to get bitter. 2. 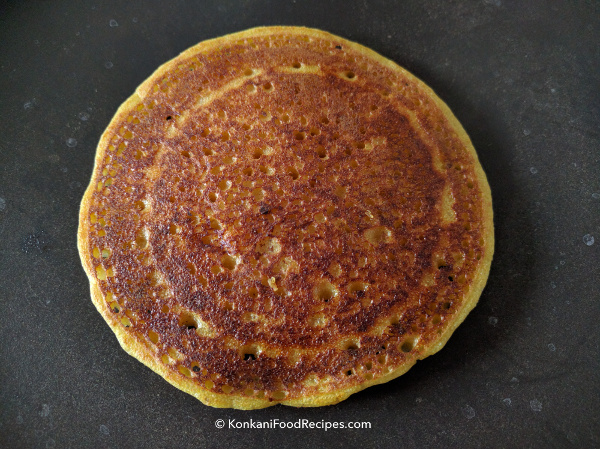 Do not add excess turmeric powder, fenugreek powder or it'll meddle with the taste of these dosas and make them bitter. 3. Do not add excess water to the batter, as the dosas will stick to the pan and won't come off neat. 4. Beaten rice, cooked rice added makes these dosas soft. 5. You can choose to add grated coconut to the batter of these dosas for extra softness. 6. Once you add jaggery to the batter, it gets diluted, so be careful with that. Do not add excess water first. Fermentation needs warm temperatures. So, in summer the batter ferments very well and doubles in quantity within a few hours (5-8 hours). With the drop in temperature, you would have to ferment them for longer (10-15 hours). But if the weather is too cold then the batter has to be kept in a warm place for it to ferment. If your oven has light, then turn on the light for a few hours with the batter in the oven. Once the oven is warm, turn off the light and let the batter undergo fermentation. 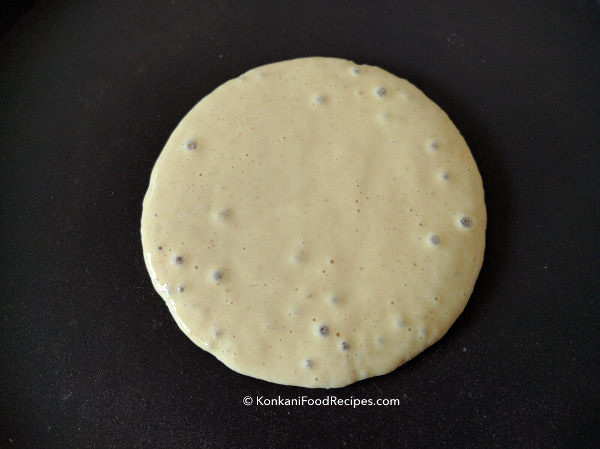 Surnalis are made two ways: the sweet dosas are called as godu surnali (godu polo) and the non-sweet dosas called as chappe surnali in Konkani. In the above recipe if you don't add jaggery then you have chappe surnali, the non-sweet dosas. Prepare savoury dosas without jaggery if do not like sweet dosas and eat them with a spicy coconut chutney. Who doesn't love these soft, fluffy dosas? 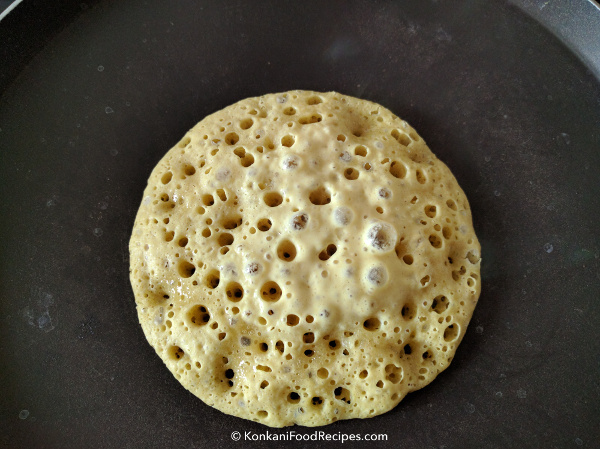 Use this batter and make puff pancakes using this appe pan or paniyaram pan. Make them for your kids and I'm sure they'll love them. Sweet appe called as godu appo in Konkani, famously known as sweet kozhi paniyaram in South India, paddu or guliappa in Kannada.